Uncle Rod Mollise's Astro Land! Featuring SCT User, the Worldwide Resource for CAT fanciers! 2010 SCT User Imaging Contest! Uncle Rod Live and Kickin'! Book Unk for your star party or club function! Captain Rod's Expeditions: AHSP 2008! Rod's Poetry: "October 22, 1962"
Welcome to the Home Page of Your Old Uncle Rod! Come on in and set a spell. Put your feet up. Let me get you a glass of that wonderful concoction we here at Chaos Manor South love so well, REBEL YELL! We're here to talk everything there is to talk about astronomy. And especially to introduce you to SCT User, the worldwide mailing list for users of Schmidt Cassegrains and other catadioptric telescopes, and The Mobile Astronomical Society, Mobile Alabama's very own astronomy club. Hurricane Katrina Comes to Selma Street...Click HERE FOR PIX! Membership is open to anyone with an interest in and a desire to learn more about astronomy. You need not own a telescope or other equipment to join us in our explorations of the universe. The MAS meets the first Thursday of each month at 7:00pm at the Mobile Public Schools' Environmental Studies Center on Girby Rd. For further information on the MAS contact the Mobile Astronomical Society, c/o Rod Mollise RMOLLISE@hotmail.com, 1207 Selma St., Mobile, AL 36604. 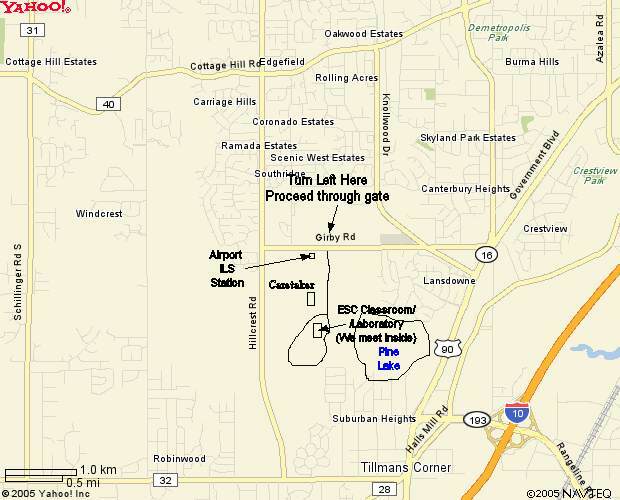 Click HERE for a MAP to the ESC! The MAS holds its meetings the first Thursday of each month at 7pm at the Mobile Public Schools' Environmental Studies Center on Girby Road. These meetings normally include both a business meeting and an informative presentation. Occasionally, we will observe after a meeting, but we reserve most of that for the MOSPs. See the scroll at the top of the page for the date of the next meeting. Once a month we come together for a group observing session. These monthly dark-of-the-Moon "MOSPs" have in the past been held on the secure and comfortable grounds of the ESC. Recently, however, we've been using a dark site in the Tanner-Williams area for our deep sky observing (the ESC is situated in the midst of heavy light-pollution). If you're a paid member of the MAS, you are welcome to attend MOSPs. For details, please email Rod at the address above. ARE YOU A NEW MEMBER WHO WANTS TO STAY INFORMED ABOUT MAS DOINGS? IF SO, EMAIL ROD AT THE ADDRESS ABOVE TO BE PUT ON THE MAS MAIL-ALERT LIST! powered by web hosting guide. Copyright 2005 Chaos South Productions. All Rights Reserved.